Maybe it’s because most of us who read comics are, to one extent or another, nerds. Or maybe it’s simply the unintended consequence of college kids having discovered back in the sixties that Jack Kirby and psychedelic drugs are incredibly potent when mixed. Regardless of the cause, comics have always had a philosophical appeal. There’s even a division of labor in terms of philosophical focus within the field: superheroes and sci-fi deal with cartoonish metaphysics, while indie comics explore existential problems. Unfortunately, ennui has been the preferred subject matter of indie creators—particularly the mind-numbing minutiae of the average comic artist’s apparently boring life. 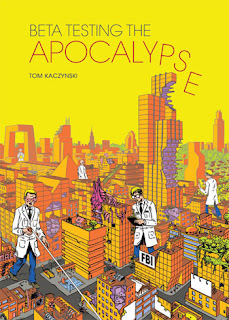 Primal angst and existential uncertainty, along with heavy doses of evolutionary sociology and architectural theory, drives Tom Kaczynski’s collection Beta Testing the Apocalypse (Fantagraphics). But unlike most "smart" indie comics, Beta Testing manages to actually be smart. And good. Really good. Kaczynski’s collection is not easy to describe, so I’ll steal his description: “Short bursts of science-fictional pulp built on uncertain architectural foundations loosely threaded with apocalyptic fever dreams into an unstable theoretical assemblage.” Beta Testing, however, does not read like an unstable work. Kaczynski’s stories all touch upon a broad overriding theme: the fragility of civilization in the face of the primordial drives of humanity. Condominiums, the art of soundproofing, modernist architecture. These are but fleeting psychic barriers, holding back the atavistic urge that lurks within us all. The subtle artwork strongly complements the complexity of the stories. The thin lines, sharp angles, and rigid geometry of Kaszynski’s work—a product, no doubt, of his architectural background—brings a clarity and simplicity that expertly balances the abstractness of the themes at the heart of Beta Testing the Apocalypse. 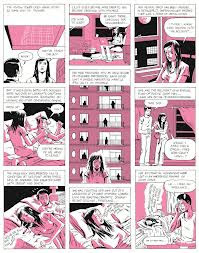 There’s a good deal of Dan Clowes in the artwork. But I am not sure if this is a good or a bad thing. Of the Beta Testing’s stories, the longer ones stand out, particularly “Million Year Boom”—a satirical take on marketing rhetoric in the midst of a Lovecraft-lite cult—and “976 Sq. Ft.,” an exploration into gentrification-induced psychosis. The best of the collection is “The New,” an original novella drawing together architecture, archaeology, and mythology in a manner reminiscent of the DC’s post-Code horror comics of the seventies. I’m not a philosopher. I have never developed the skills—or maybe the patience—that becoming a student of philosophy requires. At the same time, I don’t want to be overly modest. I teach social theory, after all. I know more about pragmatism and phenomenology, about existentialism and postmodernism than most non-specialists. But I don’t spend my weekends thumbing through Being and Time. Kaczynski's philosophical explorations, however, are subtle, his lyrical text only rarely falling into jargon. Kaczynski clearly knows what he’s talking about, though his work never seeks to lecture. The stories in this collection are accessible and relatable. One doesn’t need to have read Žižek to grasp Beta Testing’s themes and criticisms. One only needs to have only gone apartment hunting. Penalties: None after two readings.